The LEA is an engine produced by General Motors for a wide variety of compact and midsize vehicles. Displacing 2.4 liters in an inline-four configuration, the LEA is part of the Ecotec engine family. It features direct injection, variable valve timing, and is capable of running on E85 fuel. It is believed, but not officially confirmed, that the 2.4-liter LEA will eventually be replaced by GM’s newer 2.5-liter LCV or LKW engines. 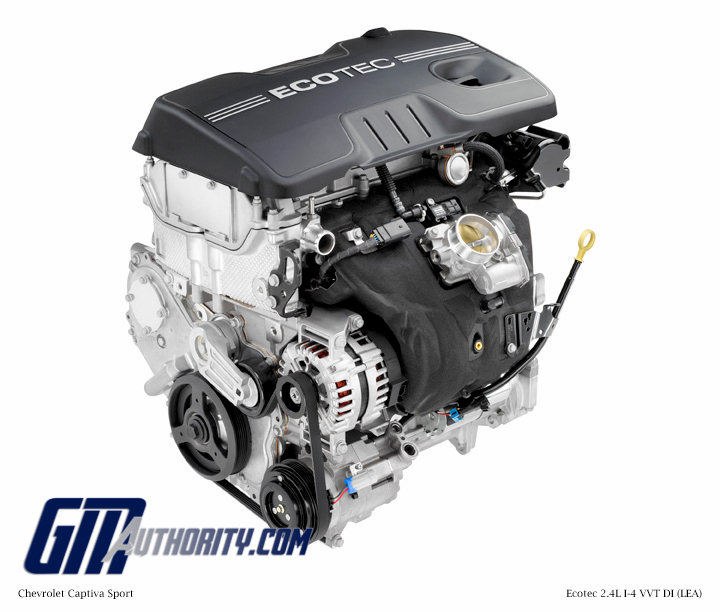 GM’s versatile and technologically advanced Ecotec 2.4L LEA is the standard engine in a wide range of vehicles. Direct injection technology helps it deliver horsepower and torque. It is also FlexFuel-capable. With the Ecotec 2.4L’s direct injection system, more power is made with less fuel, and the engine produces lower emissions. In fact, cold-start emissions are reduced by up to 25 percent. The engine delivers greater torque at lower rpm and builds it smoothly toward its peak at 4,900 rpm, for excellent, confident performance in all driving conditions. Engine Block: the Ecotec 2.4L’s sand-cast cylinder provides excellent structural support, as well as enabling greater control of noise, vibration and harshness. The main bearing bulkheads, which support the crank bearing, as well as the cylinder bore walls, have been significantly strengthened to support increased engine loads. Aluminum Pistons with Jet-Spray Cooling: the Ecotec 2.4L’s pistons use lightweight aluminum pistons, for less reciprocating mass inside the engine that enhances efficiency, decreases vibration and bolsters the feeling of performance as rpm increases. Each piston has its own directed jet that sprays oil toward its skirt, coating its underside and the cylinder wall with an additional layer of lubricant. The extra lubrication cools the pistons, reducing friction and operational noise, while also bolstering the engine’s durability. Cylinder Head: the Ecotec 2.4L has a SPM 319 aluminum cylinder head that is cast with advanced semi-permanent mold technology. This provides excellent strength, reduced machining and optimal port flow. The cylinder head is designed specifically for direct injection into each combustion chamber and includes premium valve seat, valve guide and valve materials. The cylinder head also has integral cast oil passages that feed a set of internal oil control valves that activate cam phasers, enabling variable valve timing. DOHC with Continuously Variable Valve Timing: overhead cams are the most direct, efficient means of operating the valves, while four valves per cylinder increase airflow in and out of the engine. Continuously variable valve timing optimizes the engine’s turbocharging system by adjusting valve timing at lower rpm for improved turbo response and greater torque delivery. Cam phasing allows an outstanding balance of smooth torque delivery over a broad rpm range, high specific output and good specific fuel consumption. Cam phasing also provides another effective tool for controlling exhaust emissions. Direct Injection: direct injection moves the point where fuel feeds into an engine closer to the point where it ignites, enabling greater combustion efficiency. Direct injection also reduces emissions, particularly cold-start emissions, by about 25 percent. With direct injection, the higher compression ratio is possible because of a cooling effect as the injected fuel vaporizes in the combustion chamber. This reduces the charge temperature and lessens the likelihood of spark knock. The direct injection fuel injectors have been developed to withstand the greater heat and pressure inside the combustion chamber and also feature multiple outlets for best injection control. Cam-Driven High-Pressure Fuel Pump: a high-pressure, cam-driven pump provides the fuel pressure required of the direct injection system in the Ecotec 2.4L. The engine-mounted fuel pump is augmented by a conventional electrically operated supply pump in the fuel tank.